27. 2. 2013 | A team of Max Planck researchers from Germany now showed how sunken wood can develop into attractive habitats for a variety of microorganisms and invertebrates. By using underwater robot technology, the researchers confirmed that animals from hot and cold seeps would be attracted to the wood due to the activity of bacteria, which produce hydrogen sulfide during wood degradation. Many of the animals thriving at hydrothermal vents and cold seeps require special forms of energy such as methane and hydrogen sulfide emerging from the ocean floor. They carry bacterial symbionts in their bodies, which convert the energy from these compounds into foodstuff. The vents and seeps are often separated by hundreds of kilometers of deep-sea desert, with no connection between them. For a long time it was an unsolved mystery how animals can spread out between those rare oases of energy in the deep sea. One hypothesis was that sunken whale carcasses, large dead algae, and also sunken wood could serve as a food source and temporary habitat for deep-sea animals, but only if bacteria were able to produce methane and sulfur compounds from it. 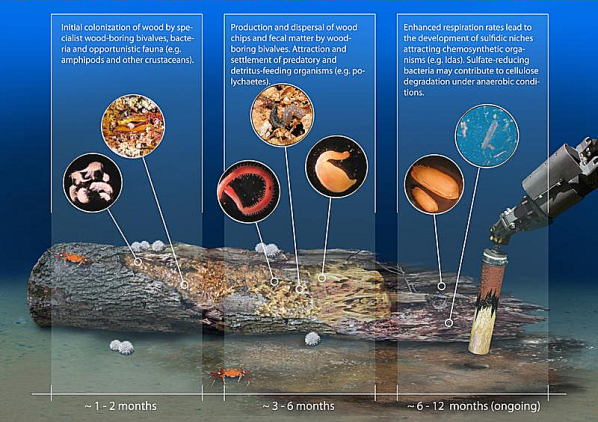 To tackle this question, the team deposited wood logs on the Eastern Mediterranean seafloor at depths of 1,700 meters and returned after one year to study the fauna, bacteria, and chemical microgradients. "We were surprised how many animals had populated the wood already after one year. The main colonizers were wood-boring bivalves of the genus Xylophaga, also named shipworms after their shallow-water counterparts. The wood-boring Xylophaga essentially constitute the vanguard and prepare the habitat for other followers," researcher Dr. Christina Bienhold explains. "But they also need assistance from bacteria, namely to make use of the cellulose from the wood, which is difficult to digest."